Day Care Woking, has been selected to appear in Asda Sheerwater’s Chosen By You, Given By Us scheme. 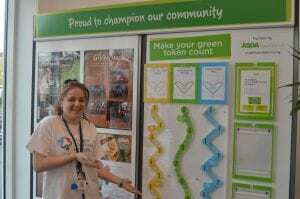 The day care service will appear on the Community Life board in store along side two other local causes until March. Customers will be able to vote for Day Care Woking using tokens and at the end of the period, the winner will receive £500 and the two runners up will get £200 each from the Asda Foundation. The service at Day Care Woking is staffed by a highly-trained team supported by a group of caring volunteers. Every week day there are a range of group and one-to-one activities on offer and hearty, healthy food served throughout the day. The service is a lifeline for older people who might otherwise just spend their time home alone. The staff are also trained to support those living with dementia and creating a safe environment for these people to spend time in. To find out more about Day Care Woking, click here.